Another month, another Secret Recipe Club assignment. Well, actually it is only my second month with the club, so everything is still pretty new to me. The reveal day coincides with the start of another two weeks dedicated to a special theme on Where Is My Spoon. So my first concern when being assigned a blog was to find a recipe suited to my present theme: oranges. And I did find a recipe and a great one, I have to say. My assigned blog this month is Casa Costello, a blog which I discovered before it was even assigned to me. I was drawn to it by the Best Reads of 2015 post, I love reading and am always curious to know what other people are reading, sometimes I find really good reads by following other people’s suggestions. Casa Costello is written by Helen, who is based in the UK. She has 3 pretty daughters and as far as I can tell she loves baking, there are lots and lots of cake recipes on her blog. Finding a recipe which involves oranges was not difficult, these swirl cookies were quickly found and baked. But I didn’t stop there, I spent quite some times clicking my way through her recipe index and bookmarked so many recipes (all sweets 🙂 ) that I’d love to make in the near future. My favorite ones are these gorgeous Baklava squares with pecan nuts and almonds, the Cherry Bakewell Tart, the Red Velvet Cake Truffles, the Raspberry and Almond Scones and so on. I am currently watching the first season of The Great British Bake Off on You Tube, so I am very much into British baking at the moment. Being allocated Casa Costello is a perfect fit, there are quite a few typical British recipes to be found there. 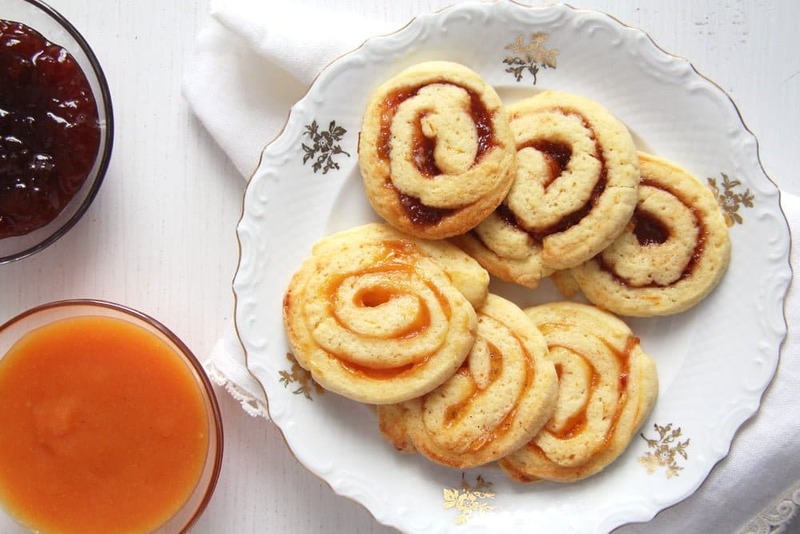 So about these orange swirl cookies: they are so delicious! I baked them last Friday in the afternoon and they were all gone by Saturday. I think my son must have eaten at least half of them, I couldn’t stop him anymore. We all loved them actually and I am pretty sure I will make them again. I didn’t change the recipe much, but I had to use another kind of jam because I did not have any raspberry jam in the house and with about 20 other homemade jam jars in my cellar, I didn’t want to buy a new jam just for baking. So I filled half of the dough with rhubarb strawberry jam and the other half with blood orange jam. The kids loved the rhubarb strawberry ones more, the adults rather went for the light bitter version made with blood orange jam. Another thing that I had to alter was the resting time of the dough. It was supposed to rest in the fridge for about 45 minutes. I had to give it more time, about an hour an a half until it had harden up enough for me to be able to roll it properly. After filling the dough and rolling it into sausages, I placed the rolls in the freezer for about an hour an a half. After this time, they were about half frozen and cutting them into neat cookies was a piece of cake. Beat together the soft butter and the sugar until pale and fluffy. Add the egg, orange zest and the juice of 1 orange. Mix well. Mix together the flour and the baking powder and fold them into the butter mixture. Knead quickly to form a dough, form a ball, wrap it into plastic foil and refrigerate for about an hour an a half or until firm enough to roll. Flour the working surface and the rolling pin and roll half of the dough into a rectangle. 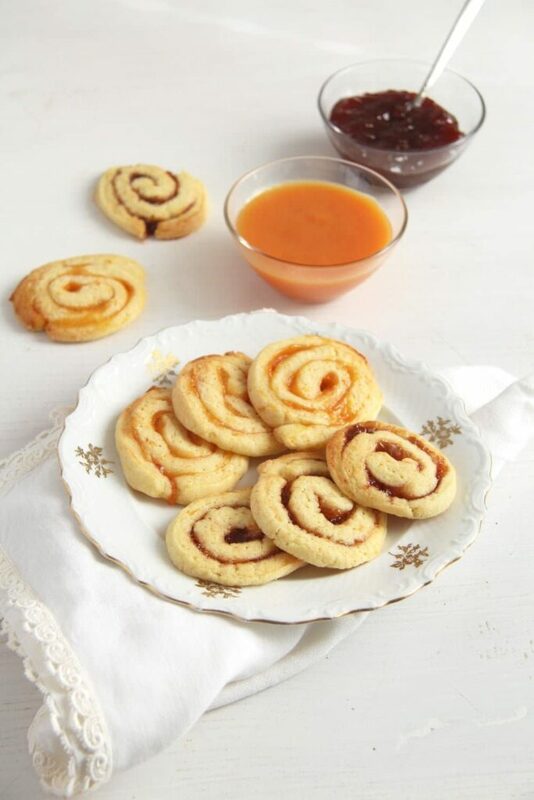 Spread 3 tablespoons of the jam evenly on the dough and roll into a sausage. Repeat with the other half of the dough. Wrap the rolls into plastic foil and place them in the freezer until about half frozen, my rolls needed about an hour and a half to reach a good cutting consistency. Take the rolls out the freezer and press them back into a nice form in case they have flatten a bit at the bottom side. Unwrap and cut into slices using a sharp knife. After slicing both rolls I had about 30 cookies. Line two baking sheets with baking paper and place the cookies on them. Bake for about 10 minutes per tray or until golden. Take out of the oven but leave on the tray for about 10 minutes before transferring to a wire rack. Let cool completely. 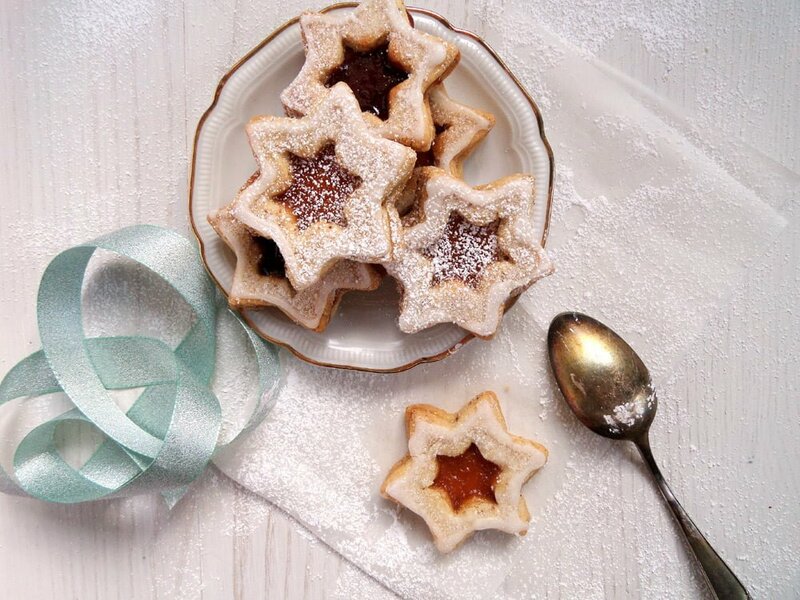 These cookies look delicious (and quite pretty). How great is it that you found a recipe in the SRC that actually worked for your current theme!? AND it happened to be a cookie! Yay! 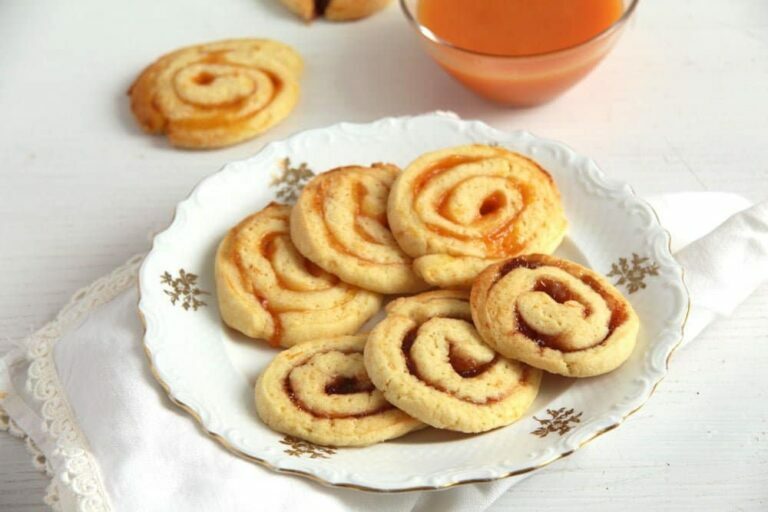 Love these swirl cookies! Since they have jam in them they are perfectly acceptable for breakfast.. right?! 😉 Cheers, my dear! Thank you and I am so glad to hear you liked my recipe. They are such pretty cookies and I bet they taste amazing! I know my kiddos would gobble them up quickly as well. Great SRC choice! Thank you, Heather. When they really like something, it really gets difficult to stop them. Thank you, Evi. I love them with black tea as well. These look yummy! This is my second month in the secret recipe club too. I need a new jar of jam! These look most excellent! I’ve also watched a couple seasons of The Great British Bake Off; the contestants and their bakes are so impressive and inspiring. I hear a US version is coming…I hope it’ll be good. I am watching the second season now, I love it. The German version is not as good though, I hope you have more luck with the US version. It’s hard to decide which one I would like more…rhubarb strawberry or blood orange! They booth look wonderful, Adina! Great super useful tip of leaving the dough in fridge to harden and thanks for sharing such a wonderful recipe. Looks so soft and flavorful! Thank you and I am glad you found something of you. 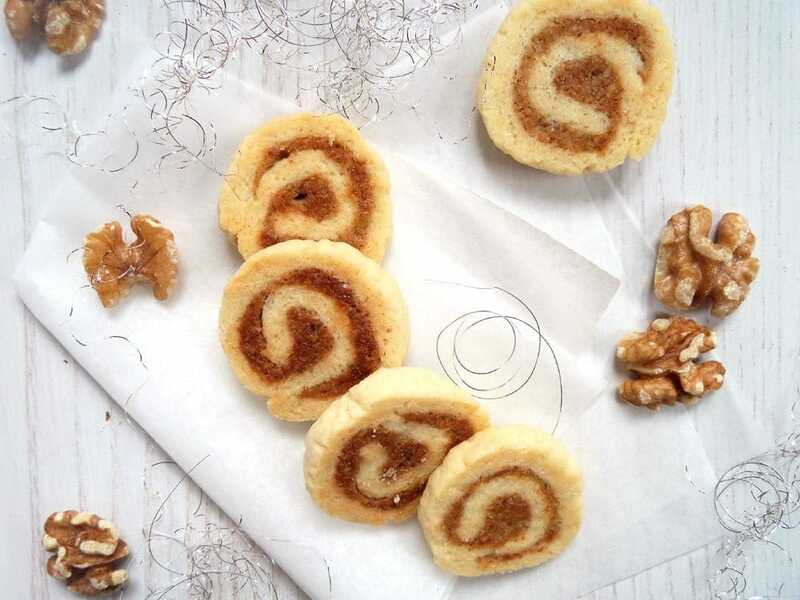 Perfect looking swirl cookies, Adina! 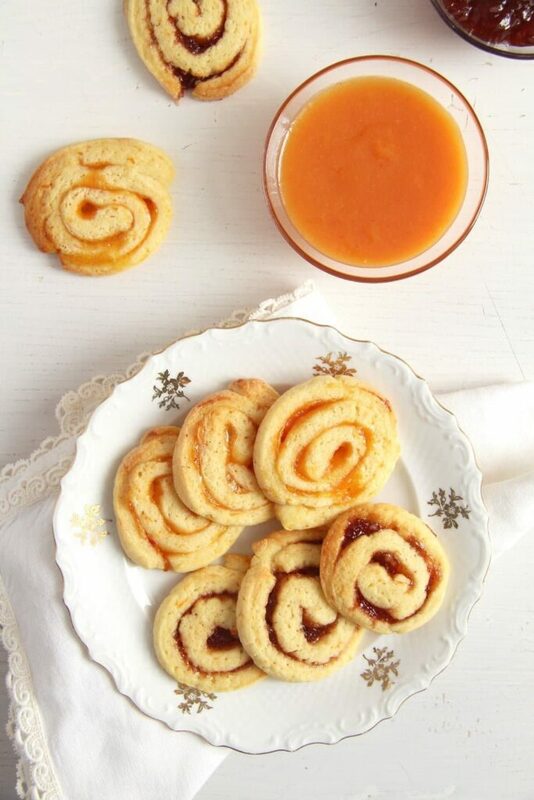 I’ve been wanting to bake something sweet using oranges for a long time, I have to give these a try. They sound and look super duper yummy. 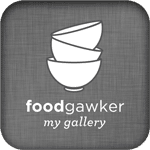 Thank you, Helen, I was glad to have been assigned your blog, I found so many recipes I want to make. These cookie are just gorgeous Adina! Especially with the colorful and I’m sure very flavorful jams. My husband watches the show with me as well sometimes, although he has no interest in baking or cooking, but he still finds it good. Now I want to have a tea party.